Okey Dokey is one of those quirky small Japanese games that managed to slip under my radar in its initial release. This comes as no surprise as there are so many little games that seem to come out, and that’s when I limit my search to only Japanese companies/designers that have a known track record for me… I hear about them occasionally from W. Eric Martin when he ventures into the craziness of the Japanese Game Markets, I used to get some through a now-defunct subscription service, and I am always introduced to a few new ones each time I’m around Joe Huber or Lorna. The guys at TMG (and a few other companies, such as IELLO) have made a thriving (and hopefully successful) business venture trying to identify these gems and bringing them to the attention of the Western gaming audience. Over the past few years, there has been a steady stream of games from the Far East showing up in the domestic release schedule. 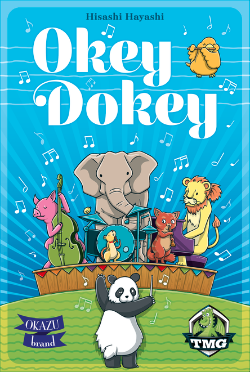 Okey Dokey is an engaging and beguilingly difficult co-operative game from Hayashi-san, the principal behind Okazu games. He has also designed games such as Lost Legacy, Rolling Japan, Minerva, Yokohama and Sail to India which all find themselves in my permanent game collection. Like many of the best designers, his games seem to run the gamut as far as styles and mechanisms. In this game, players work together to put on a successful animal symphony. 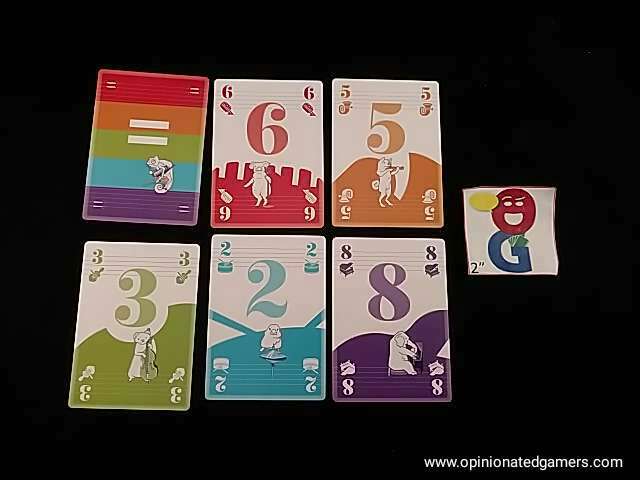 To do this, they must work together to build a 10×5 tableau of colored cards; but there are many restrictions on how the symphony can be constructed! The game is played with a 40 card main deck, consisting of 5 colored suits, each with cards numbered from 1 to 8. Additionally, you can add up to three wild “equal” cards into the deck; the more “equal” cards you have, the easier the game should be! The deck is shuffled, and each player is deal a starting hand of cards (5 cards for a 4p game, but 7 cards for a 2p game). There are ten reset cards – five stacks of two are made, and they are placed in a column on the table. These reset cards are not part of the tableau, but they can be used to show where the five rows of cards in the game will be built. The players are allowed to communicate somewhat… They can say how many cards they have in a color but they cannot say or hint at what the specific values are of those cards. They could recommend what suits they would like to play or would like others to play. They may never show their cards to another player. Once all the players look at their starting hands, they can decide amongst themselves who will start playing. That player will make the first play to the table and then play will continue clockwise around the table until the game ends in some fashion. On a player’s turn, the active player has two options – they can either play a card from their hand to the table OR they can play a reset card from the table. There are a few rules to consider when playing a card from your hand. First, each of the five rows on the tableau are dedicated to a single color; the color of which is decided upon by the first colored card being played there. Second, there is only one active column in the game at any time – thus, a card must be played to each of the five rows before a new column begins. You are free to play in any open position in a column. When you play a card, it must be equal or greater to the card directly to its left. The only way to play a card equal in value is to play one of the special wild “equal” cards; which counts as a card of any color and has the same numerical value as the card directly to its left. If you play a card out of your hand, you draw a new card to replace it from the deck (as long as cards are available). If the deck is depleted, you no longer draw. If you choose to play a reset card, you simply take one of the available reset cards next to a row and play it into that row. This card has a number value of zero. There can only be two reset cards played to each row. Also, there is a mandatory rule that each column must have EXACTLY ONE reset card in it. As there are ten total reset cards in the game, this means that there will be exactly one reset card in each column in a successful tableau. If you play a reset card, you do not get to draw a card from the deck. 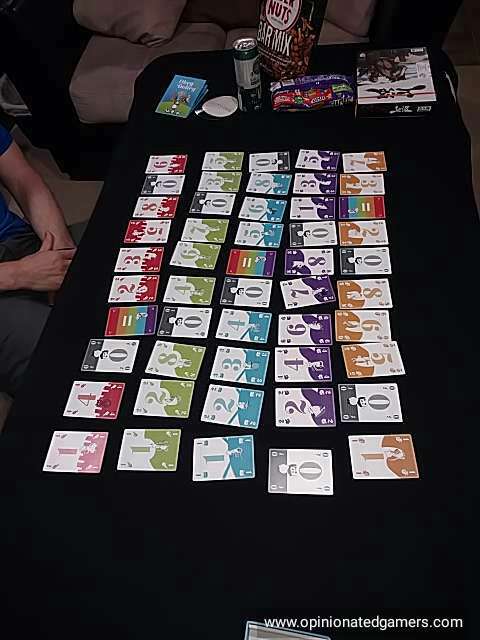 The players win if they are able to complete the fifty card tableau, with five rows of cards, each in one color, with only ascending card values with the exception of the reset cards. If a player cannot make a legal play, the players lose. You could choose to count the number of cards played as a score to measure your partial success. So, the idea of the game is unbelievably simple; so simple that I’m mad that I didn’t invent the game first! When reading the rules, it seemed like this was going to be a really easy co-op game, and one that would be a simple time-killer. I could not have been more mistaken… So far, this one has completely vexed our group, and I think we’ve only reached the 40-played-card stage once so far. There are a lot of possible pitfalls along the way, and it takes both excellent communication as well as some good old fashioned luck to succeed. The restrictions on where to play cards is what you have to work around. So far, it seems like the biggest challenge is figuring out where to play the reset card in each column. The rules say that you can openly communicate on this issue, and we definitely spend the majority of our planning trying to work this out. It is, of course, made much more difficult when players are not allowed to discuss the values of their cards. “I can play in Red”. “I really have a play for Red”. “I can only play in Red” are the sorts of things that you’ll hear in the game. But, until you actually see the cards, you’ll not know how well the play really is. Each column feels like its own little puzzle, trying to figure out which player is going to play into which row, and who is going to play the reset card where… However, we have fallen into the serious mistake of considering each column as a separate puzzle. This is a recipe for doom. As the play moves continuously around the table, you really need to consider the next 5 plays as the active window, if not further out. We have lost a number of times because our perfect plan fell apart in a new column when players did not have playable cards for the colors left to us at that time. You have to constantly be looking ahead, and players need to be continually aware of what suits they have to play. You can temporize for a bit by playing a reset card instead of playing a card out of your hand. However, if you play a reset card, your hand is static and you’re left with the same crummy cards that you had the last turn, so you still need to figure out how to get out of that pickle. Like with any game with vague communication rules, you’ll have to figure out what is an acceptable limit to the grey zone of limited information. The rules say that you cannot hint at the values of your card. So, we feel that we cannot say “I have a mid-range yellow card” or “I have a low yellow card”. However, we do think it’s acceptable to say “I really have a great play in Yellow”. In the end, you can do whatever you want, but it’s probably best to figure out what is kosher in your group. The game plays quickly so far in our group, but that’s because at least half of our games have died before getting halfway through building the tableau. We’re steadily getting better at the game, but we have yet to win, and we are still playing on the easiest difficulty level which gives you three “equal” cards added into the forty card deck. But, it’s been a big hit here, and each time that we fail, we are pretty excited to try again. I haven’t seen such an excitement level surrounding impending failure since we failed repeatedly at Samurai Spirit or Geister Geister Schatzsuchmeister. This one has been an unexpected hit, and it definitely vying for the most favored co-operative game around here right now. It has the advantage of being in a super small box, and it will make my travel kit as this is a easy-to-teach co-op game that I find more fun than “The Game”. Joe Huber (1 play): This is not a game I rushed to pick up, as while I generally enjoy cooperative games, I’m not drawn to play most of them repeatedly, and thus am usually happy to play someone else’s copy. In this case, Lorna’s. And – while I like the theme (which, I notice, Dale managed to almost but not quite completely leave out of his description), and I enjoyed my play of the game well enough – it’s still a cooperative game for me. And, unfortunately, not one that meets the general exception to my rule – the cooperative games which I enjoy enough to have in my collection all share the quality of not being possible to play solitaire. So while I’d be happy to play it again, should others wish to, and while I find it a well-designed game, it’s not one that I’ll be picking up. 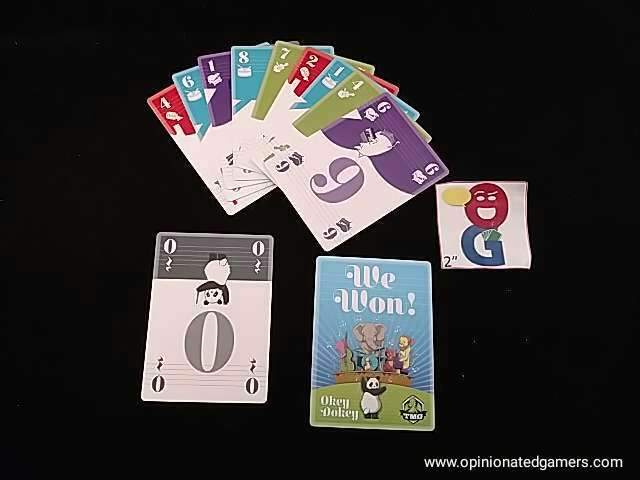 Craig V (3 plays): Okey Dokey is a deceptively challenging game! Teaching and learning HOW to play the game are simple, but playing it WELL is EXTREMELY tricky. I really like the cooperative puzzle and love the cards. The artwork is cute and looks really nice both when the cards are held in hand and when they are all laid out on the table together. The game has many similarities to Hanabi and The Game, but I like Okey Dokey best. I have had a lot of fun playing and LOSING at this game, but am completely hooked and definitely won’t be turning down any opportunity to play it more! Lorna I enjoy Okey Dokey, it’s surprisingly challenging and works well as a cooperative.